Custom app development services from SynapseIndia are robustly equipped to empower businesses the power of technologies like Android Wear. The company has a spectacular range of mobile app development services that cover virtually every kind of business and industry. The services include iOS app development, Android app development, and hybrid mobile app development, and apps for mobile commerce, or m-commerce. The company has delivered a large number of tailored apps, such as eLearning apps. SynapseIndia presence in industries like real estate, healthcare, entertainment, and financial services is a testament to its success as a software vendor. A large number of businesses have adopted a mobile strategy, using mobile apps as a marketing channel. The apps help businesses understand the behavior and preferences of prospective customers through engagement. Moreover, mobile apps can be used to launch moves like a customer loyalty program. Such programs have long been useful in ensuring that the customers come back more often and spend more. Enterprise mobile apps also provide access to a range of advanced features like a sales tracking functionality and integration of a shopping cart. SynapseIndia has a team of Google and Apple certified app developers. They combine the power of logical and clean coding with a creative app design to deliver best-in-class mobile apps to all the clients. 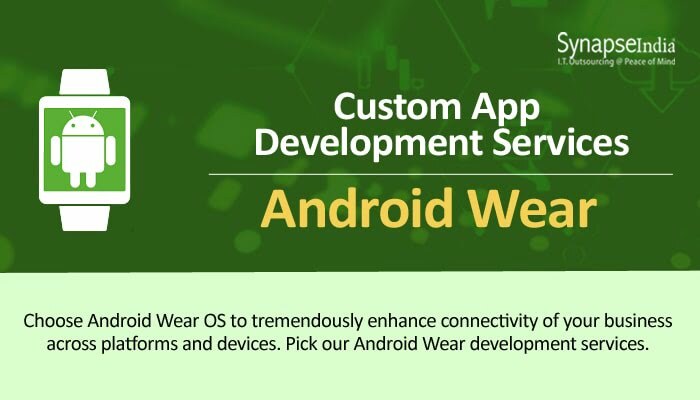 With its Android Wear development services, the company makes it easier for clients to leverage wearable technology in order excel in an increasingly competitive market.